Conventional tampons can sometimes contain chemicals and pesticides. While evidence about whether or not tampons are dangerous is inconclusive, it only makes sense to reduce our exposure to toxic chemicals if at all possible. After all, tampons are something that we’re putting into our bodies for up to a week each month. We prefer the non-toxic version, of course (more details at: Are Tampons Dangerous?). Are you among these people who still use the ordinary tampons? Then, you are undeniably a major contributor of harm to the environment. Reality bites, but indeed, a lot of women today use countless conventional tampons and sanitary pads that are hazardous to both our health as well as nature. Fear not because it’s not yet too late for a change! Go natural and start using organically-made tampons. Many people go to their local health food store looking for organic tampons or sanitary pads. You’ll probably notice once you get there how expensive these products are. That’s the bad news. The good news is that organic feminine hygiene products are much cheaper if you buy them online. Amazon has all the styles, brands, sizes, etc. at quite reasonable prices. We often find that they’re not that much expensive than similar non-organic products. 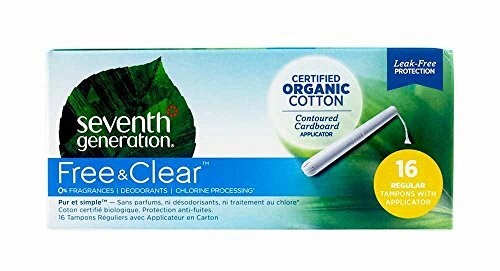 The Organic Essentials Cotton Tampons are your best companions to the big switch (to natural). It is also among the most affordable organic tampons on the said site. These cotton tampons come in a set of 16 and the price is not that much more expensive than regular tampons. Some organics are way too expensive (in our opinion! ), so it’s refreshing to see a reasonably priced option that’s both good for your body, as well as the environment. The Organic Essentials Cotton Tampons set is definitely the right choice for every menstruating person. It does not just address the issues on hazardous chemical content of a conventional tampon and the negative impacts on the environment. These organic tampons are similarly priced to the non-organic ones. Above all, this product is certainly the right choice for your body because you’re reducing the amount of chemicals you put into it each month. Can be difficult to find in regular stores (that’s why we recommend buying this product on Amazon. If you’re looking to go more environmentally friendly during your period, then you’ll need to consider going organic. Check out our top picks here: Top 5 Organic Tampons. When you consider the environmental and economic issues, the Organic Essentials Cotton Tampons are an obvious choice. It only makes sense to do anything you can to reduce your exposure to toxic chemicals, particularly for something that you put inside your body. Making the switch to organic feminine hygiene products is one simple way to do that. These organic tampons are also affordably priced considering they’re organic. They’re actually some of the cheapest ones on the market, but they still get some great user reviews over on Amazon. A cheaper alternative for a top-quality product? We certainly love that here at Reusable Menstrual Cups! Why not save a few bucks if you can? 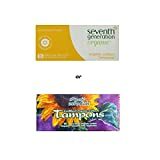 What are your thoughts about these tampons from Organic Essentials? Leave a comment below and let us know what you think. Also be sure to give this article a share on Facebook, Pinterest, or Twitter. Let’s share the eco-friendly period awesome with the world!